Chinese railroad workers most definitely were included in the May 10, 1869 joining of the rails ceremony. Honor the memory of the heroic Chinese transcontinental railroad workers by telling their story with historical accuracy. Referring to "the picture taken to commemorate the occasion" fudges the facts since there were multiple pictures taken. Presumably this refers to UPRR photographer A.J. Russell's "champagne" picture as if it were the only one, while in fact Russell didn't exclude the Chinese from his photography. To the contrary, A.J. Russell took a photograph on the same day specifically to show the Chinese workers which he titled "Chinese at Laying Last Rail UPRR." The CPRR management went much further, commissioning the famous painting of "The Last Spike" by Thomas Hill that includes the Chinese railroad workers, as well as the earlier stereoviews taken by A.A Hart, the railroad's official photographer to promote the construction project and showing the Chinese workers. Also omitted is a critical part of the story: the fact that the portions of the transcontinental railroad built in Utah where the golden spike ceremony was held used mostly Mormon contractors and crews, largely replacing Chinese or Irish laborers used earlier in other states. The famous A.J. Russell photograph (or the related stereviews by Charles Savage and by A.A. Hart) could not include the Chinese workers[sic] photographed earlier participating in the joining of the rails ceremony because at the moment the famous photo was being taken it was AFTER the conclusion of the ceremony and the Chinese workers were away from the two locomotives to dine at J.H. Strobridge's boarding car, being honored and cheered by the CPRR management. "J.H. Strobridge, when the work was all over, invited the Chinese who had been brought over from Victory for that purpose, to dine at his boarding car. When they entered, all the guests and officers present cheered them as the chosen representatives of the race which have greatly helped to build the road ... a tribute they well deserved and which evidently gave them much pleasure." The Chinese were not only not "excluded" from the ceremony on May 10, 1869, but three of them, Ging Cui, Wong Fook, and Lee Shao survived long enough to also be included in the commemorative parade held exactly 50 years later! While virulent anti-Chinese racism was certainly prevelant in 19th century California, Central Pacific Railroad officials facing economic necessity, rapidly overcame their initial prejudice against the Chinese once they hired some Chinese laborers and discovered that their work was outstanding. Don't unfairly malign great men whose vision, investment, and hard work made a project many thought impossible into a stunning success. The few surviving Chinese-American descendants of the CPRR Chinese railroad workers whose ancestors built the difficult mountainous and arid western portions of the first transcontinental railroad should look back with well justified enormous pride at their brave ancestors' amazing accomplishment – the manual construction of the greatest engineering project of the 19th century that united our nation. What the historic record actually shows is that the CPRR management overcame the prevalent racist attitudes of the day, recognized the great value of Chinese labor, and at the completion of the railroad construction properly honored and cheered the Chinese workers who built the railroad and were included in the ceremonies on May 10th, 1869. Those Chinese were free men seeking opportunity in America, paid comparable wages in gold for their incredibly hard construction work, who were able to save two-thirds of their railroad wages to enable them to return to China with considerable wealth. Eight Chinese railroad workers, including Ging Cui, Wong Fook, and Lee Shao, were the men who actually joined the rails at Promontory Summit, Utah on May 10, 1869 and were honored on that day by the railroad officials for the magnificent Chinese contribution to building a transcontinental America. "Tolerance: the free, competitive marketplace makes bigotry and prejudice very expensive. ... "
The price for not overcoming the anti-Chinese sentiment prevalent in 1860's California would have been quite extreme for the railroad builders if they chose to indulge their personal prejudices – the inability to build the Central Pacific Railroad, the collapse of their business, and personal financial ruin. The many books by economist Thomas Sowell about race explore how market economies make it too expensive to discriminate because the intolerant must bear the full cost of not hiring the best person for the job. A book for children claims that workers' "hazardous labor earns them only pennies a day" while the truth is that they were paid (adjusting for the current price of gold) about $1,880/month or $63/day as uneducated laborers with no experience. Another online article in a publication promoting racial victimhood, Building the Pacific Railroad: Contributions Of Chinese Americans, makes all the same mistakes yet again, for example quoting incorrect conclusions from "Professor Madeline Hsu of Asian American Studies at the University of Texas-Austin [who] says, 'the absence of Chinese from the celebrations at Promontory Point, where the Transcontinental Railroad was finished, was perhaps the most glaring example [of the lack of Chinese representation].' "
As noted above, Chinese were not only present at the joining of the rails celebration, they were the ones who placed the final rail, were photographed doing this, were absent from view in photographs taken immediately after the ceremony because they were at a party with the CPRR management to recognize the Chinese contribution, and the very same Chinese men were photographed 50 years later in the parade commemorating the event. The reason that there were not large numbers of Chinese at Promontory Summit on May 10, 1869 is because that last portion of the railroad in Utah was constructed mostly by Mormon contractors, not by the CPRR Chinese workers. The racism against the Chinese arose from the early labor movement, not from railroad management, nor is the timing correct as the railroad was completed in 1869. Instead, the virulent anti-Chinese sentiment came later from labor leaders in the face of the continued high unemployment after the crash of 1873 which started in Europe and spread to the United States. The unemployment rate in San Francisco was 20% in 1877 when the racist Working Man's Party was agitating that "The Chinese must go." Labor leader Dennis Kearney on December 28, 1877 demonstrating in San Francisco against the Chinese said that "We intend to try and vote the Chinese out, to frighten him out, and if this won't do, to kill him out ... the heathen slaves must leave this coast." The railroad management had been in favor of immigration of Chinese labor to California. Kearney threatened the railroad managers that they must fire the Chinese workers, while also saying: "A little judicious hanging right here and now will be the best course to pursue with the capitalists and stock sharps who are all the time robbing us." So the actual history seems instead to be that labor was virulently racist, while the railroad management was in practice mostly pro-Chinese. By contrast to the actual safety record in the construction of the transcontinental railroad, did you know that 25,000 men died in the construction of the Panama Canal that was completed in 1914 after first French and then American efforts?
" ... the idea that China 'invented everything' has become a kind of vulgar common coin. So much so that, in California schools today, the kiddies are taught the the Chinese built the Central Pacific Railroad. A bright fifth-grader would likely ask, then why didn’t they build one in China, and the reason is that, of course, there is more to building a railroad than pounding spikes, and China, for all its genuine innovations, was deficient in surveying, metallurgy, mechanics, theory of heat and a number of other ingredients required to build a railroad; and in other, equally important but less technological requirements, such as management and finance." Of course the Chinese workers did provide the manual labor to construct the Central Pacific Railroad, but did not provide the innovation, engineering, entrepreneurship, and management of that great construction project in the Western United States in the 19th century. At other times and places, Chinese certainly did build all manner of railroads and other businesses, at times that their entrepreneurial spirit was not suppressed by imperial or communist government oppression. "As the post-Civil War economy declined, labor unions struggling to organize blamed Chinese 'coolies' for undercutting wages. Hostility became widespread." By GAIL SCHONTZLER, April 3, 2011. Also see, The Chinese Exclusion Act of 1882 by James M. Lindsay.
" ... During the 1860s, nearly half the Chinese population in the United States worked for the Central Pacific Railroad under brutal conditions. Once the transcontinental railroad was completed, two-thirds of its Chinese labor force returned to China; the rest went into fishing and agriculture, many signing labor contracts to work the former plantations of the Old South (replacing slave labor) while others migrated to frontier cities such as Los Angeles. Sections of white immigrant workers, led by demagogues, were led to perceive these abruptly unemployed Chinese workers as a threat. ... Denis Kearney’s speech to ten thousand unemployed workers in San Francisco in 1877 ... At that rally to support striking East Coast railroad men, Kearny railed against the railroad magnates and big landowners. He reserved his most venomous attacks, however, for the Chinese workers, whom he accused of stealing 'American' jobs. Anna Smith, chair of the Workingmen’s Committee, defended the mob’s actions, comparing them to the Minutemen of Lexington. She asserted that it was 'a mob that threw the tea overboard in Boston Harbor' and ended her oration with, 'I want to see every Chinaman thrown out of this state.' Kearney fantasized exploding dynamite-loaded balloons over Chinatown and erecting gallows on every vacant lot. This Yellow Peril hysteria climaxed in the atrocities of 1885-1886: in Rock Springs, Wyoming, in Issaquah, Tacoma, and Seattle, Washington, and in Juneau, Alaska, where a hundred Chinese men were set adrift at sea. California had its own Klan-like 'Order of Caucasians'; it waged a relentless campaign to terrorize the Chinese. In 1885 alone, thirty-five California communities experienced anti-Chinese riots or forced expulsions." 1. Consider the source, and rise above it. 2. The more I know, the more I need to know. 3. Folks that live in glass houses shouldn't throw stones. The gentle reader should understand that the writer of such drivel has a message that he/she wants to deliver to influence the reader to join him/her in a rush to judgment. I am reminded of the letter send to a fellow that had just met a young lady that appeared to have all the qualities of a fine wife. The choosing a life companion, dear Anonymous, is too serious a matter to be so hastily decided. The selection of a partner for a dance or a ride may be of little moment; the choice of an associate for business may be determined in a short time; but the acceptance of a partner for life requires the most serious deliberation. You should take ample time for the STUDY of the character, temperament, disposition and accomplishments of the lady (OR THE WRITER OF DRIVEL) whom you choose to be the sharer of your labors, joys, sorrows, reverses and prosperity. Courtesy Google Alerts, here is a comment about another apparent attempt at manufacturing a fake racial controversy, i.e., because the Chinese were supposedly excluded ("No Chinese need apply?") from a "Hell on Wheels" television script about the Union Pacific Railroad. (The controversy makes no sense, of course, as the Chinese worked for a different railroad, the Central Pacific, not for the Union Pacific which is the subject of the script.) So nobody was excluded from anything. Another ridiculous myth, this time about bodies in Lake Tahoe. Time to stop making up nonsense. "Why didn't Chinese laborers get credit for their work for the American railroad?" They did get credit and are getting credit. All the same historical errors are again repeated in the Wall Street Journal October 26, 2011 commentary by Jeff Yang, "Do Chinese Pioneers Get Railroaded in AMC’s ‘Hell on Wheels’." The Bloomer Cut accident that was reported in the Placer Herald, April 16, 1864, indicates that before Chinese workers were hired in large numbers white workers were exposed to exactly the same sorts of risks as the Chinese workers hired later, so any claims the welfare of Chinese workers was disregarded because of their race seems inconsistent with the historical evidence. See, The price of 'Yellow Peril', Opinion by Jeff Yang. Later, he was named U.S. ambassador to Chile, and then U.S. commissioner for the Central Pacific Railroad (ironically, overseeing the greatest achievement of the so-called 'coolies' he so despised.)" " ... Chinese who had come to America to mine gold were denigrated for their small size, lack of skills and even their habit of bathing daily. Many white workers, however, proved unreliable, deserting their jobs for gold prospecting or other endeavors. In frustration, Crocker forced construction chief James Strobridge to hire 50 Chinese men. Despite Strobridge's harassment, none quit, and most were productive. Soon he would hire only Chinese. More than 11,000 were working on the tracks by 1869. ... "
But, this does not seem entirely plausible as Ah Toy was listed as a Chinese Foreman in the January and February, 1864 Central Pacific Railroad payroll sheets who is likely the same man that 12 years earlier already worked for James H. Strobridge on his farm according to the Calfornia Special Census of 1852. Also see, Deaths during railroad construction. "The workers received about $1-3 per day, but those brought directly from China received far less." "But the historic celebratory photo from that day the Central Pacific and Union Pacific came together doesn't include her relatives or any Chinese workers, a fact not lost on [railroad worker descendant, Margaret] Yee. Chinese workers, she said, were not only discriminated against — they were paid one-third that of their Irish counterparts — but forgotten when the job was done." See related discussion, "How much were the Chinese paid?" Central Pacific contractor, Charles Crocker, encountered strong prejudice from foreman James Harvey Strobridge when he decided to hire Chinese laborers. Strobridge's attitude changed when a group of Irish laborers agitated over wages. Crocker told Strobridge to recruit some Chinese in their place. Instantly, the Irishmen abandoned their dispute. Sensing at least that fear of competition might motivate his men, Strobridge grudgingly agreed to hire 50 Chinese men as wagon-fillers. Their work ethic impressed him, and he hired more Chinese workers for more difficult tasks. Soon, labor recruiters were scouring California, and Crocker hired companies to advertise the work in China. The number of Chinese workers on CP payrolls began increasing by the shipload. Several thousand Chinese men had signed on by the end of that year; the number rose to a high of 12,000 in 1868, comprising at least 80% of the Central Pacific workforce. 'Wherever we put them, we found them good,' Crocker recalled, 'and they worked themselves into our favor to such an extent that if we found we were in a hurry for a job of work, it was better to put Chinese on at once.' "
See, In rare apology, House regrets exclusionary laws targeting Chinese, by Moni Basu, CNN.
" ... The House of Representatives passed a resolution Monday expressing regret for the passage of the Chinese Exclusion Act, which imposed severe restrictions on Chinese immigration and naturalization and denied Chinese-Americans basic freedoms because of their race. ... "
"Another poignant souvenir of the era is the all-white crowd at the 1869 Golden Spike celebration, marking the completion of the vital Transcontinental Railroad. The Central Pacific portion was built by Chinese laborers, not one of whom is shown in the photo published around the world." Again, the crowd wasn't "all white" and the Chinese men who laid the last rails and spikes of the transcontinental railroad were, at the moment the famous A.J. Russell photograph was taken, in Superintendent Strobridge's rail car being praised and toasted by the railroad management for their vital contribution to the building of the just completed Central Pacific Railroad. "The Central Pacific did not appear out of nowhere but on the backs of thousands of meagerly paid Chinese laborers ... "
Thirty dollars per month in gold coin was anything but "meagerly" and the Chinese came wanting the railroad jobs where they could save 2/3 of their income to soon become wealthy by the standards of southern China. CPRR foreman, Amos L. Bowsher, who wired the telegraphic connection at Promontory which sent the word out over the wires that the last spike had been driven later recalled: "It was certainly a cosmopolitan gathering. Irish and Chinese laborers who had set records in track laying that have never since been equalled joined with the cowboys, Mormons, miners and Indians in celebrating completion of the railroad." Another example of fudging the facts is the claim that the Chinese and Irish railroad workers were trying to blow up one another with explosives, but the supposed witness and author of the account, UPRR Chief Engineer Dodge, was actually about two thousand miles away from the transcontinental railroad construction site at the time. See related discussion in which it is pointed out that J.H. Strobridge was included in the Russell photograph. Over 11,000 labored on transcontinental railroad, completed 145 years ago" by Mike Gorrell, The Salt Lake Tribune, May 9, 2014, has similarly misleading analysis, stating (as if the role of the Chinese railroad workers is not one of the most well known aspects of the building of the first transcontinental railroad, and that they were paid in gold about the same wages) that "when the formal photograph of that historic occasion was taken, the Chinese laborers ... were literally out of the picture. ... a part of their history long forgotten and neglected ... erased from our history books ... they worked ... for less money than other ethnic groups". Searching for "Chinese workers removed from image". Pure fantasy/fabrication – there are no historic transcontinental railroad images from which Chinese workers were removed. This is especially implausible as the technology to alter photographs was not created until long after 1869. Also, the large A.J. Russell photograph was taken on a wet plate collodion glass plate and the negative survives at the Oakland Museum, so that you can easily make a comparison and verify that the prints are identical to the photographic negative. Don't understand the repeating meme that there was a great injustice because "x" was forgotten by history, when that plainly isn't true. The man history forgot: The railroad genius behind Roseville’s birth has become invisible. For an example of anti-Chinese racism in the late 1870's see the California Supreme Court decision "In re HONG YEN CHANG on Admission." That there was virulent anti-Chinese sentiment in the 19th century, does not excuse repeating mostly untrue made up rumors about the history of the railroad, such as "the Central Pacific Railroad hired as many as fourteen thousand Chinese workers to build the first leg of the tracks that would connect America’s two coasts. There, they labored under white foremen who often punished stragglers with the whip. A common task for Chinese crews carving railroad beds into mountainsides was to dangle a single man over ledges, in a basket thousands of feet above the ground, where the man would place a blasting powder charge in the face of the mountain, light the fuse, and pray that his companions pulled him up fast enough to escape death from flying rocks. During the wintertime, these same men would clear up to fifteen feet of snow just to begin each work day. Avalanches were a common cause of death." Chinese railroad workers were not treated anything like slaves, there were no men handing in baskets, there is no evidence that blasting powder was needed at Cape Horn where the rock is friable and could have been removed with just a pry bar, fifteen foot snow drifts do not reaccumulate each day, and railroad worker deaths however tragic should not be exaggerated, i.e., one avalanche killed eight Chinese laborers as reported on March 6, 1868. Also see Chinese American history volunteer group. The Congressional testimony does not agree with Northern California businessman, C.C. Yin's claim that “The Chinese workers were treated like slaves ... "
It is a distortion to assert that "The Chinese workers endured tremendous hardship, and unlike their bosses, they didn’t get rich." Pay of thirty dollars per month in gold coin was sufficient to allow the Chinese workers to save 2/3 of their income to soon become wealthy by the standards of southern China. They crossed the Pacific Ocean to make their fortunes, and apparently many succeeded. "The Chinese [railroad workers] ... are paid from $30 to $35 in gold a month ... They are credited with having saved about $20 a month." —Alta, California, November 9, 1868 Newspaper.
" ... Chinamen ... receive $35 per month (gold) ... Of this they save from $20 to $23. ... " —The New York Tribune, June 26, 1869. The statement that "Chinese railroad workers’ contributions weren’t recognized when the 100th anniversary happened" is incorrect because the principal publication concerning that anniversary was the National Golden Spike Centennial Commission Official Publication in the Utah Historical Quarterly, 1969, entitled The Last Spike is Driven contains the article Chinese Laborers and the Construction of the Central Pacific by George Kraus which definitely recognizes the contributions of the Chinese workers on the Central Pacific Railroad.
" ... Chinese laborers ... were paid less than fellow Caucasian workers ... The Chinese railroad workers received no acknowledgment at the official celebration of the 100th anniversary of the completion of the railroad in 1969." "According to Olga Eng Chin, her grandfather Eng Mun Dom (We Wen Tan) worked on the railroad from California to Utah. He came from the ancestral village of Munlow, where all the Engs came from. After working he returned to China with the equivalent of $10,000, which was viewed as a fortune." The most well known fact about the Central Pacific Railroad's construction seems to be that the excellent work was performed mostly by Chinese workers. Thus, the wording of a Stanford University Chinese railroad descendant oral history question "How do you feel about the lack of attention that their contributions have received?" seems to prejudge the issue peculiarly to the contrary. While there are no historic transcontinental railroad manipulated images from which "Chinese workers were removed," the golden spike images taken on May 10, 1869 do appear to be staged for the camera. That seems just fine, as it is obvious that it's a planned celebration with locomotives and people taking their places before the camera to record the event for posterity. People do respond to being photographed, as do subatomic particles. But now people are so hypersensitive, that staged photographs are considered "ethically challenged." Doesn't a problem really only arise if people are deceived by the images? This week's episode of the television series Hell on Wheels repeats the lie that Chinese railroad workers were paid one third the salary of white workers.
" ... the brutal – and often ignored – story of the Chinese ... Chinese laborers who worked for the Central Pacific Railroad ... were systematically paid less than their white laborer counterparts, and used by management to quell labor grumblings." No, difficult manual labor was typical of the 19th century, not "brutal," the Chinese role in building the first transcontinental railroad is one of the most well known facts, the Chinese were paid in gold, about the same wages as white laborer counterparts, and Chinese were transported across the Pacific Ocean and hired by the CPRR because caucasian workers in 1860's California were in short supply because they preferred to mine for gold, not work railroad construction jobs. 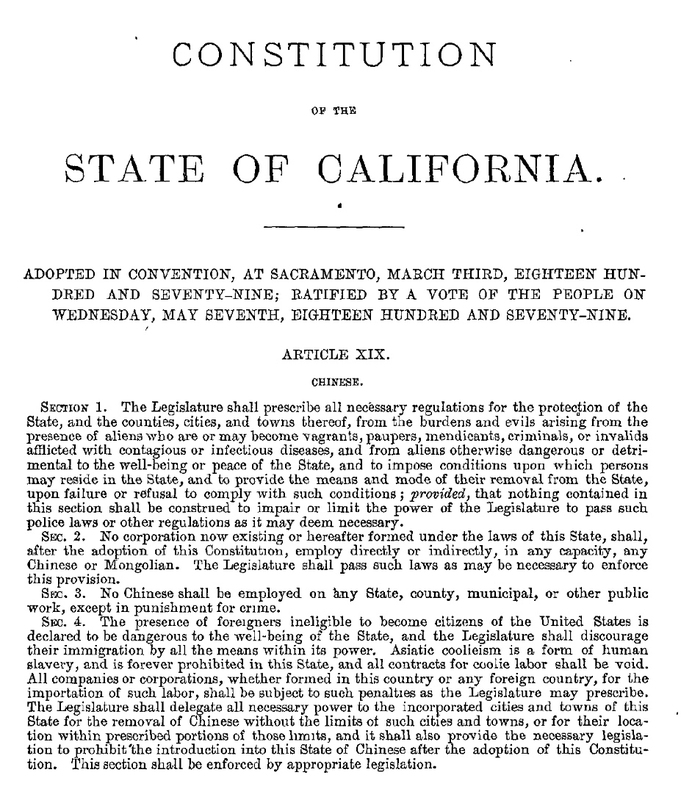 1879 California Constitution - Article XIX "Chinese"
CONSTITUTION of the STATE OF CALIFORNIA. RATIFIED BY A VOTE OF THE PEOPLE ON WEDNESDAY, MAY SEVENTH, EIGHTEEN HUNDRED AND SEVENTY-NINE. Section 1. The Legislature shall prescribe all necessary regulations for the protection of the State, and the counties, cities, and towns thereof, from the burdens and evils arising from the presence of aliens who are or may become vagrants, paupers, mendicants, criminals, or invalids afflicted with contagious or infectious diseases, and from aliens otherwise dangerous or detrimental to the well-being or peace of the State, and to impose conditions upon which persons may reside in the State, and to provide the means and mode of their removal from the State, upon failure or refusal to comply with such conditions; provided, that nothing contained in this section shall be construed to impair or limit the power of the Legislature to pass such police laws or other regulations as it may deem necessary. Sec. 2. No corporation now existing or hereafter formed under the laws of this State, shall, after the adoption of this Constitution, employ directly or indirectly, in any capacity, any Chinese or Mongolian. The Legislature shall pass such laws as may be necessary to enforce this provision. Sec. 3. No Chinese shall be employed on any State, county, municipal, or other public work, except in punishment for crime. Sec. 4. The presence of foreigners ineligible to become citizens of the United States is declared to be dangerous to the well-being or the State, and the Legislature shall discourage their immigration by all the means within its power, Asiatic coolieism is a form of human slavery, and is forever prohibited in this State, and all contracts for cooiie labor shall be void. All companies or corporations, whether formed in this country or any foreign country, for the importation of such labor, shall be subject to such penalties as the Legislature may prescribe. The Legislature shall delegate all necessary power to the Incorporated cities and towns of this State for the removal of Chinese without the limits of such cities and towns, or for their location within, prescribed portions of those limits, and it shall also provide the necessary legislation to prohibit the introduction into this State of Chinese after the adoption of this Constitution. This section shall he enforced by appropriate legislation. Shameful discrimination by anti-Chinese voters in California in 1879, compared with the favorable treatment by the pro-Chinese Central Pacific Railroad in the 1860's. Also see "Fake history: Researchers say there’s no evidence Chinese laborers died in race to complete railroad to Ottawa [Canada] 150 years ago." Lawrence Journal-World, December 24, 2017. I haven’t been checked this thread for about 4 years. However, I did point out Mr. J.H. Strobridge was In th picture of celebration himself 4 years ago. You mean Mr. J.H. Strobridge' invited the 8 Chinese workers to join the lunch, then himself sneaked away to take the photo of celebration? Not make sense. Unless you can provide proof. Chinese workers were photographed at the May 10, 1869 joining of the rails ceremony. It is known that "J.H. Strobridge, when the work was all over, invited the Chinese who had been brought over from Victory for that purpose, to dine at his boarding car" and, as you, Cliff, previously pointed out that Strobridge appears in the A.J. Russell "champagne" photograph. With that proven, but no additional information, the rest is speculation. But, any claims that the Chinese railroad workers were excluded from the joining of the rails ceremony have been clearly disproved. ... "Lawmakers in Congress for their part still lead by radical Republicans whose principles have been forged in the fight against slavery continue to resist all efforts to get them to legislate against the Chinese on the basis of their race. But by 1875, the political dynamic in America had begun to shift as Democrats in Washington began to understand that the Chinese issue could be indispensable to the post Civil War rehabilitation of the Democratic Party. The issue of Chinese labor becomes a very easy one to galvanize the constituents of the Democratic Party, working men in particular, many of whom come from European immigrant background, would have been working class, would have been concerned about what appeared to be the flooding of Chinese workers into the nation. And that's where we don't have just simply a local story but one that then has large national resonance. The Democrats suggest that the Chinese labor were actually equivalent to black slaves. So you had this political pressure against the Republicans who are accused of advocating for Chinese coolies and so that makes it possible for the exclusion movement to get the support from the East Coast politicians." "Chinese ... erased from that history"
Ridiculous: Information about the CPRR Chinese railroad workers is extremely well known! Christopher MacMahon, a volunteer at the Nevada State Railroad Museum in Carson City and PhD student in history at the University of California Santa Barbara – PhD research examines the environmental impacts of early Nevada settlement, and how those ecological changes shaped relationships between Euro-American settlers and the Paiute and Washoe tribes. 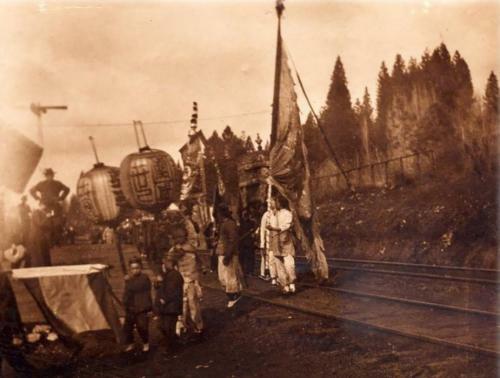 Also see, "Chinese laborers take part in a festival during railroad construction at Dutch Flat. Photo courtesy of Placer County Museum." Also see: Three Interpretations of the Role of Chinese Railroad Workers in the Construction of the Central Pacific Railroad by Calvin Miaw, March 8, 2015.